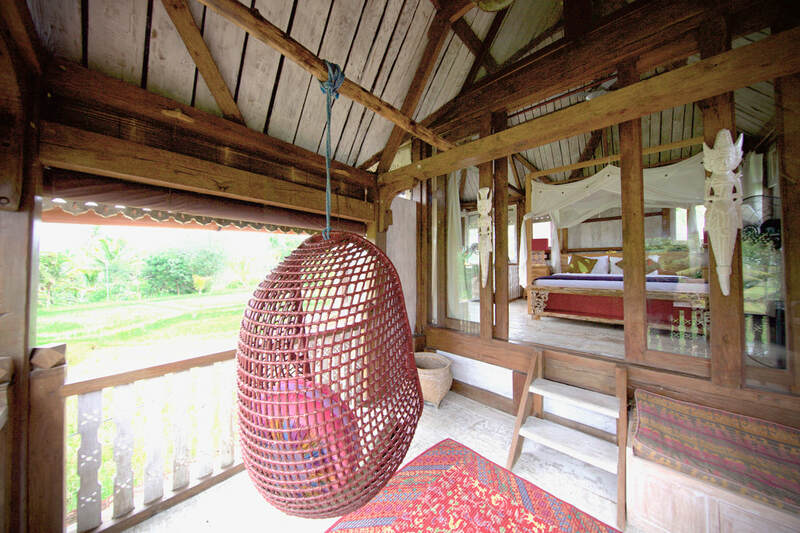 The Dutch Joglo Master Suite occupies the top 2 levels of the Dutch Joglo, and offers a romantic couples Suite. Past honeymooners have been enchanted! All the authentic details and quirks of the old Joglo can be seen in the Master Suite – from the oversized, chunky floor boards, to the detailed fretwork of the balconies, the soaring cathedral style ceilings and an intriguing attic-style door opening into the expansive master bedroom. Luxuries have been incorporated with authenticity, in the way that only true Balinese craftsmanship can offer. The entrance balcony overlooks the rice fields and the pool area, through European hand carved fretwork, offering plenty of space for lounging and immersing yourself in the rhythm of the rice fields. Beyond the entrance balcony is the living area, where a modest monk greets you welcome. The lounge room includes two daybeds which double as additional single beds. Take the antique staircase up through to the attic style door, opening onto the panoramic vistas of the Master Bedroom. 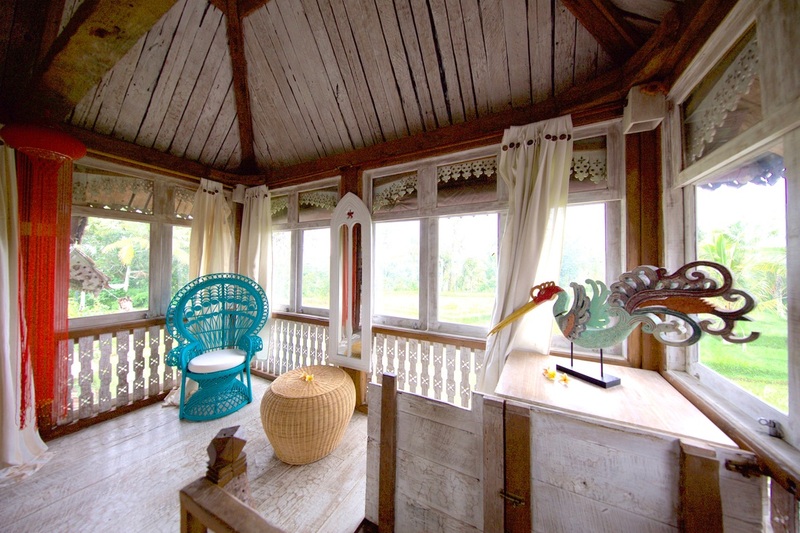 The Master Bedroom features carved balustrading, soaring cathedral ceilings and expansive 360 degree views of the rice fields from all its windows. A large yet intimate balcony flows from the bedroom, and from it you will see not only the rice fields but the northern mountains - Mount Batukaru, and the sacred Mount Agung - and, on a clear day, the distant sea. The simple, organic Zen inspired bathroom invites in nature and offers a soothing escape from the heat of the sun. Take a shower while gazing across to the ducks splashing in far away fields. The bathroom is behind the living area.